However, it being our first time in Cambodia, we’d arranged for an airport pick up through our hotel to minimise hassle. As we exited Siem Reap Airport, a tuk-tuk driver by the name of Mom, immediately approached us asking if we needed a tuk-tuk. We initially said no, thinking our hotel driver was about to fetch us anyway. However, we soon realised the hotel had mixed up our arrival time and we needed an alternative plan. While waiting, we had a little chat with Mom, whom we quickly took a liking to. Instead of waiting even further, we decided to go ahead with him. 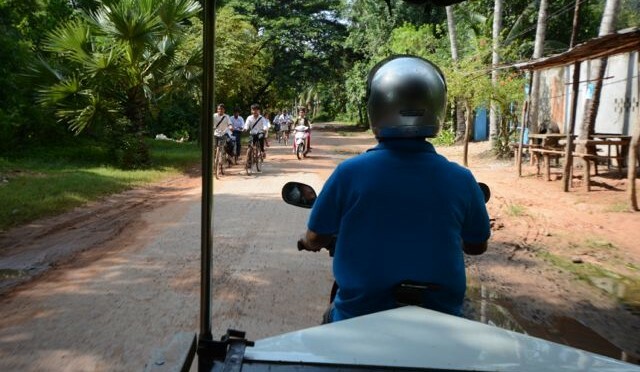 The hotel mix up turned out to be a blessing in disguise because we gained, instead, a safe and reliable tuk-tuk driver for the rest of our stay in Siem Reap. He spoke excellent English to boot. I actually really enjoyed the tuk-tuk drives in Cambodia. It’s easier for them to manouver around narrower roads, especially through the kampongs, and travel at a speed fast enough yet still a comfortable pace for photo taking. Mom was great with suggestions on what do, or what to do first, with the time we have. Basically, he ended up making plans and itineraries for us whenever we were in the “I don’t know what to do first” mood. He was also there exactly at 5am in the morning to pick us up from the hotel, for the sunrise at Angkor Wat. On the morning we wanted to head to Tonle Sap, he recommended us a different start off point where it’s quieter and scams are lesser and we enjoyed ourselves so much more because of it. He’d also offered for us to pay for the services only at the end of our trip, and if we’re truly satisfied with his driving. But we refused to do so and paid him daily, in case he needed the money immediately. We were really happy with his driving and would definitely recommend him to friends who might be heading to Siem Reap. // If there’s ever a time you want to see something else aside from just the temples, or for suggestions on places to eat, asking your driver for suggestion is probably the best bet. If you’d like to receive his cell phone number instead, do leave a comment and we’ll email it over to you. We come from vacation from December 3 to 6, and some relatives have recommended your services. We will be staying at the Sumeru Boutique hotel, and we wanted to visit the main temples of Angkor and something else that you recommend us only on the 4th and 5th. you are available? How much money would you tell us? what includes? I don’t think that Mr. Mom reads our blog. You should try sending him an email to his email address listed in the blog post.